give some examples of abnormalities involving the muscular system. A large proportion of the skeletal musculature is formed from the myotomal cells of the somites. Note that the most cranial somites - the 4 occipital somites - provide myotomal cells to the developing tongue. The remaining myotomes more caudally become organised into a dorsal column called the epimere, from which the deep extensor muscles of the back develop, while the more ventro-laterally placed hypomere contributes muscles to the body wall. Note how the spinal nerves reflect this subdividion by having a posterior primary ramus (to the epimere), and an anterior primary ramus (to the hypomere). Some body wall muscles develop in situ from local mesenchyme. The same is true of the limb musculature - this develops from the mesenchyme of the limb buds. The embryonic pharyngeal arches give rise to numerous muscles in the head and neck - the muscles of facial expression, mastication, swallowing, speaking, etc. (forming body wall - three-layered anterolaterally). This develops from splanchnic mesoderm around the endothelial heart tube. Recall that the heart soon begins to beat - this demonstrates that some cardiac muscle fibres have differentiated rapidly in week 3. Smooth muscle fibres develop from mesodermal cells throughout the body, but in terms of bulk, the greatest proportion is derived from the splanchnic mesoderm around the gut tube and its derivatives, for example the respiratory system. Although generally speaking you will not need to know how particular skeletal muscles develop, there is one that is of practical interest - the diaphragm. Occasionally the diaphragm develops with a deficiency large enough to allow abdominal contents to herniate into the thorax - usually when the baby tries to establish breathing at birth. This condition is known as diaphragmatic hernia. 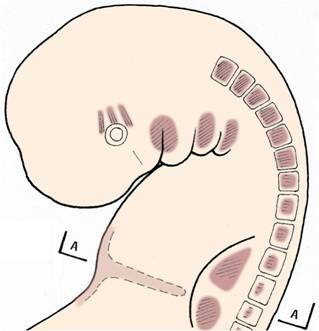 Notice that development of the diaphragm begins in the cervical region of the embryo. You will recall that the motor supply of the diaphragm comes from the phrenic nerves which arise from cervical levels of the spinal cord: "C3, 4, 5, keeps the diaphragm alive". The limb buds first appear at the end of week 4. The upper limb buds are slightly in advance of the lower limb buds. The arm buds develop alongside the lower cervical and upper thoracic segments; the leg buds develop alongside the lower lumber and upper sacral segments. Each limb buds consists of a mesodermal core covered by ectoderm. The ectoderm at the tip of the limb bud is thickened and known as the apical ridge. The apical ridge is thought to control initial development of the limb bud. In the 6th week, the distal ends of the limb buds flatten to form hand and foot plates. The digits are defined by radially-organised zones of cell-death in the hand and foot plates. Failure of this process results in fusion or webbing of the digits - syndactyly. Extra fingers or toes may develop, a condition known as polydactyly. The developing limbs rotate. At first, the arm buds and the leg buds extend laterally, approximately at right angles to the long axis of the trunk. The preaxial border in both cases lies cranially and the postaxial border caudally. Towards the end of the embryonic period, the upper limb becomes adducted at the shoulder, so that the preaxial border of the arm lies laterally. 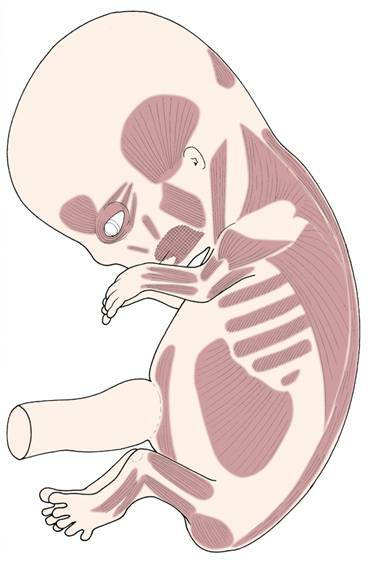 (The fetus usually flexes and pronates its forearm, so this will reposition the preaxial border of the more distal portions of the limb.) The lower limb rotates medially so that the original dorsal surface of the limb is brought to face ventrally, particularly in the lower segments. These rotations can be identified in the patterns of the dermatomes, muscle groups, and nerve plexuses. Endochondral ossification of the limb bones continues throughout the fetal period and after birth, until fusion of the epiphyses occurs in the late teens/early twenties. Often, there is a close relationship between skeletal and muscular abnormalities. Revise the abnormalities you encountered in the previous section on skeletal development, but this time note the associated muscular defects. Another abnormality to look up is muscle agenesis. 1 Which germ layer gives origin to almost all the muscle tissue? 2 Compare and contrast the general organisation of the muscles of the thoracic wall with those of the abdominal wall. 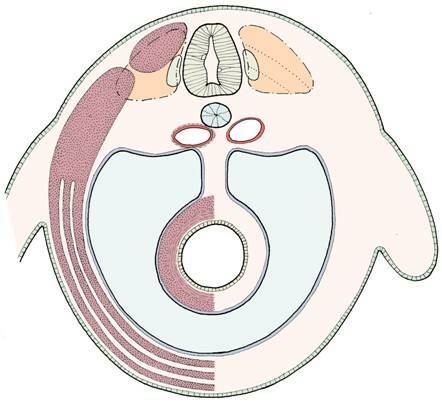 4 Which part of the diaphragm is formed from the septum transversum? Which other embryonic structures contribute to the definitive diaphragm? How do you explain the nerve supply of the diaphragm in embryological terms? 5 What might be the consequences of a defect in the diaphragm? 6 In a baby with spina bifida, the erector spinae muscles become displaced antero-laterally in the region of the lesion. What effect might this have on the already damaged spine?